228 pages | 29 B/W Illus. In 21st Century Airlines: Connecting the Dots, Nawal Taneja addresses the challenges and opportunities facing the airline industry as it tries to innovate and create products and services that are radically different by ‘connecting the dots’ at four key levels: recognizing the implications of global events, improving cross-functional collaboration within the organization, working more closely with the travel chain, and providing much higher engagements with connectors within the social networks. The book synthesizes insights gained from the experience of non-traditional businesses, such as Uber, that have no physical assets and that focus on scalability through platforms, as well as traditional businesses, such as Mercedes-Benz, that are transitioning from operators of physical assets to adapt to the on-demand and sharing economies. These insights show pragmatically that digitizing airline businesses would require digital mind-sets, digital technologies, digital strategies, and digital workplaces to explore new frontiers in value for both customers and airlines. 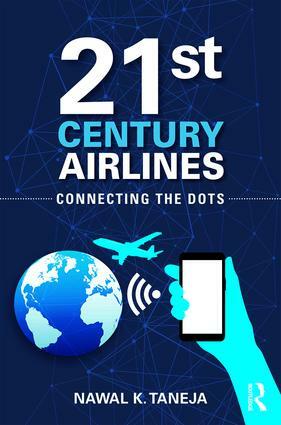 Moreover, forward-thinking airlines need to consider working with bimodal organizational structures, in which one group optimizes current business models (network, fleet, and schedule planning, as well as revenue management) while a second group explores innovative ways to add digital features to physical products to provide a consistent experience throughout the journey. The book is written for all senior-level practitioners of airlines and related businesses worldwide, as well as senior-level government policymakers. Nawal Taneja, whose experience in the aviation industry spans almost five decades, has worked for and advised major airlines and related businesses worldwide. His experience also includes the presidency of a small airline that provided schedule and charter service with jet aircraft and the presidency of a research organization that provided consulting services to the air transportation community throughout the world. On the government side, he has advised worldwide Departments of Civil Aviation, Finance, Economics, and Tourism in matters relating to the role of government-owned airlines and their management. Within the academic community, he has served on the faculties of the Massachusetts Institute of Technology (as an Associate Professor) and at Ohio State University (Professor and later as Chair of both the Department of Aviation and the Department of Aerospace Engineering).